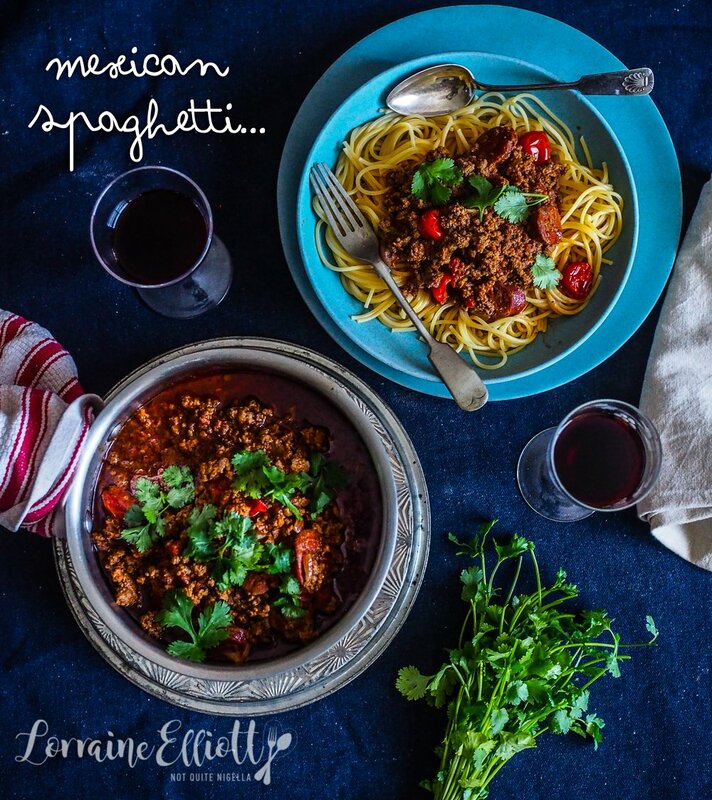 If you want something deliciously crowd pleasing may I offer you this flavoursome Mexican beef spaghetti? 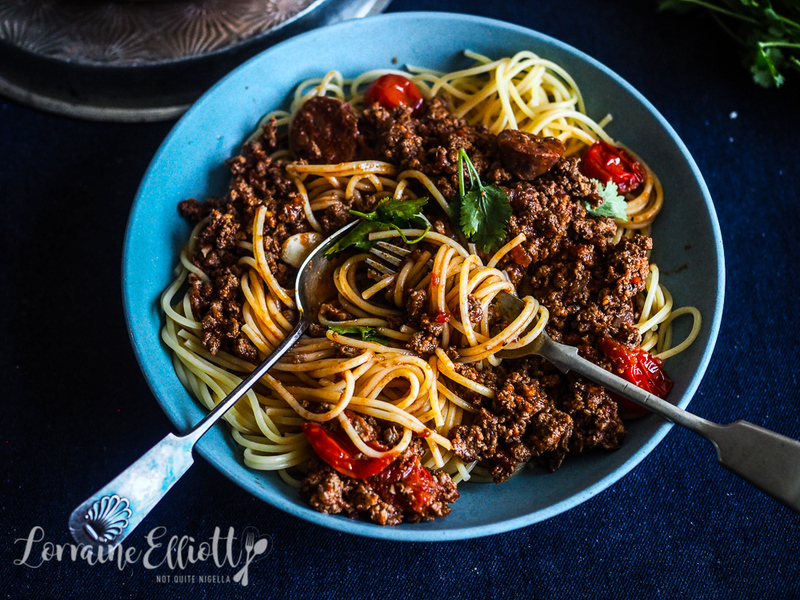 Beef mince is seasoned with Mexican spices, chorizo, chilli and tomato and then cooked down until you get a rich sauce that can pair with spaghetti or added to crunchy sourdough toast! I got this idea from a breakfast benedict where they offered a Mexican benedict with chorizo and beef mince. It was so tasty that I wanted to make a version of it at home. 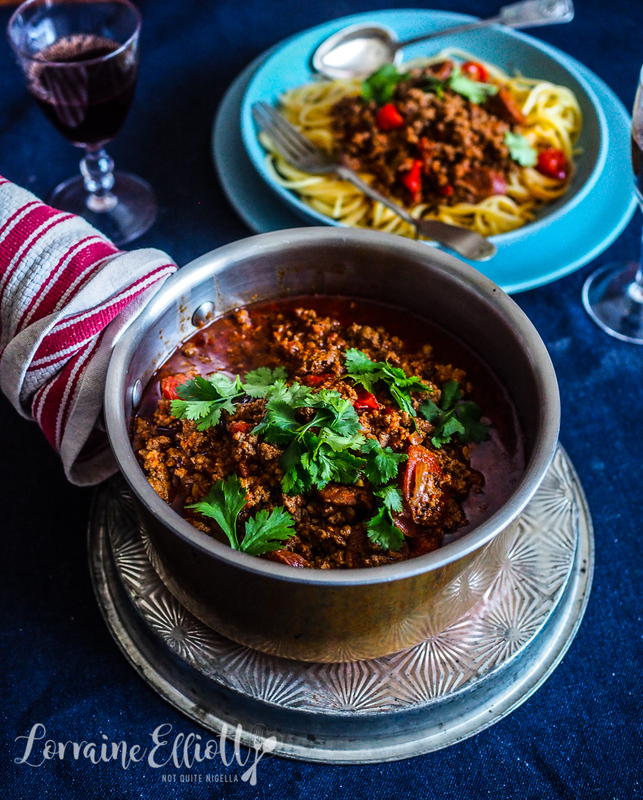 I served this with spaghetti and it has also adorned thick wedges of sourdough toast and inside a jaffle because it is very versatile. 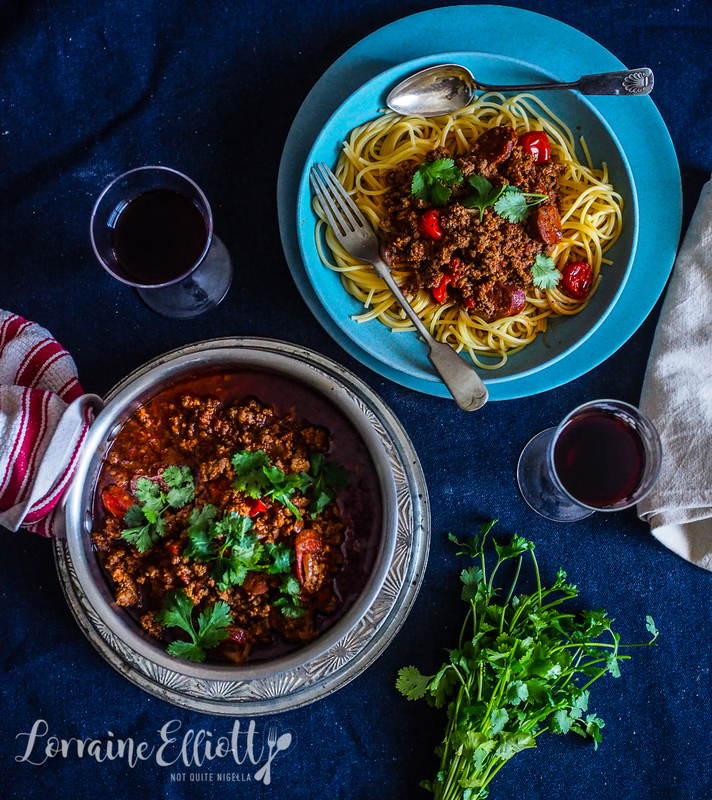 And if you like tasty, easy meals, this is a pushy recipe! I recently had a situation where clarity in communication was important. Ivy, Mr NQN and I recently visited a pub. Ivy and I got up to order because Mr NQN doesn't care about food (probably why he didn't remember the Mexican mince). The bartender was a bit impatient as Ivy chose her wine, he sort of rolled his eyes and started doing other things but there was no queue of people behind us or anyone waiting. He then took our order and when we ordered three dishes. The bartender was going back and forth as he was taking our order but we didn't think anything of it. Except the wrong item arrived. The man that brought us the order was a bit confused and we explained our order. The bartender marched over and said, "So this is what you ordered right???" and he reeled off our incorrect order. We clarified our order with him. "NO YOU DIDN'T" he said, so aggressively that we were all startled, including Mr NQN. We argued back and forth for a bit. Ivy and I could not have been clearer and he was distracted as he was taking the order. And for people that eat out a lot, we rarely get the wrong item. He finished with a, "I'd like you to be clearer when you COMMUNICATE," he said condescendingly, putting a hand on my arm and then he spun on his heel before we could answer. I don't mind when people touch me or are tactile, but not in that context. "Woah what the hell was that?" we all said to each other. Ivy and I were furious at his condescending tone. We ate our food and vowed never to go back again. And as we were leaving Ivy and I looked out for him to tell him off for being such a douche but he was nowhere to be found. She wanted to point out that she makes a living by communicating clearly to people and that her livelihood depends on it! So tell me Dear Reader, do you ever feel like people don't listen properly? Are you a clear communicator? Would you eat this with pasta or on toast? 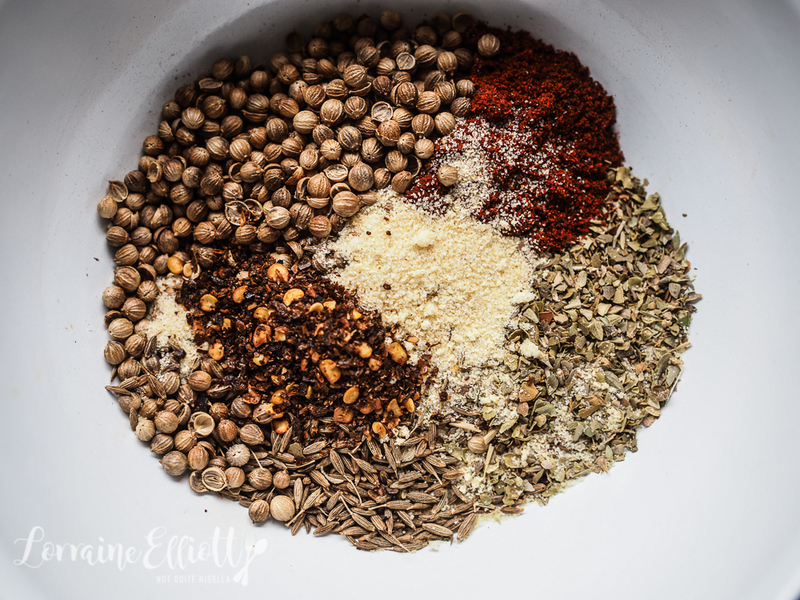 Step 1 - I find this easiest to get the spice mix ingredients together in a bowl first. I then dry fry it in a large cast iron pot. Then fry the onion in 3 tablespoons of oil until translucent. 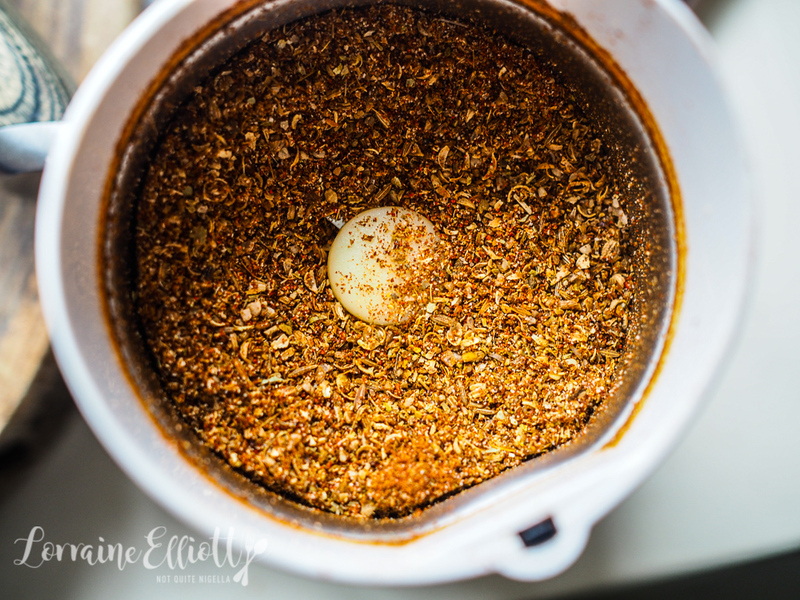 Add the garlic and fry for a minute. 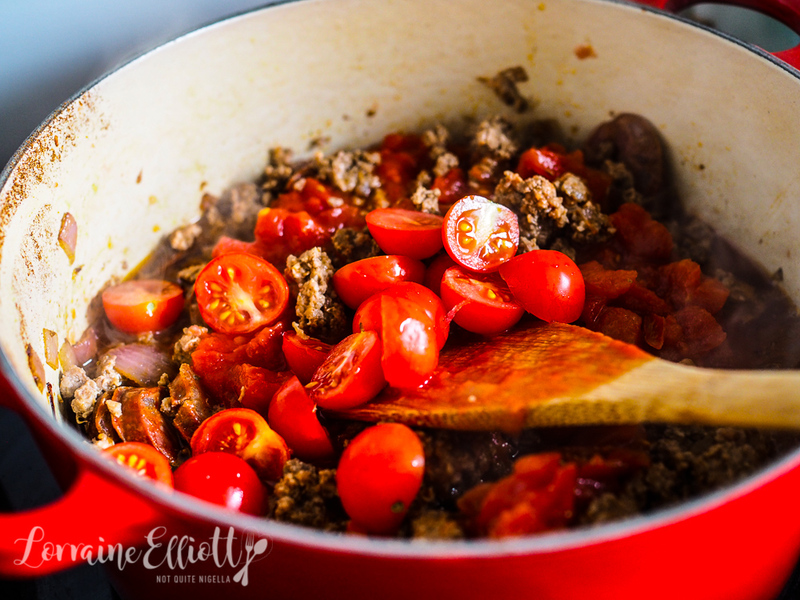 Add the chorizo slices and fry for a minute and then add the beef mince and brown well. Step 2 - Add the tinned tomatoes, tomato paste and cherry tomatoes and simmer until the sauce reduces - about 10-15 minutes. Season with salt and pepper. Step 3 - Meanwhile cook the spaghetti until al dente. Add the spaghetti to the sauce or ladle the sauce on top of the spaghetti. Top with coriander.